At the Jan 24th Rotary Luncheon, our guest speaker was Sophie Burke, who was a short-term exchange student to Italy in July 2018. 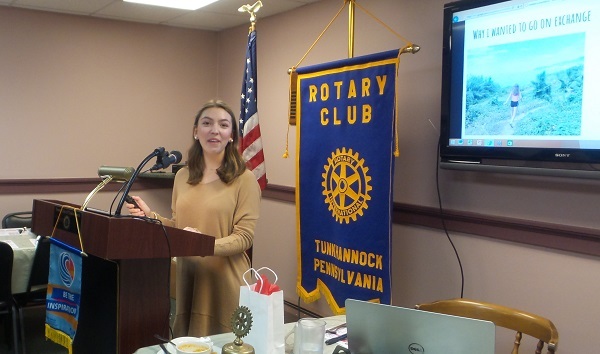 Beatrice Bursi, short-term inbound exchange student from Italy came to Tunkhannock in early July 2018. Then Bea and Sophie flew to Italy, where Sophie stayed with Bea’s family outside of Milan. She got to visit several areas in Italy including Venice and even traveled to France and Spain. Since the Burke's were a host family for inbound 2017-2018 exchange student Vittorio Sica, Sophie then visited with the Sica family before her return to the US. Sophie and her family will be traveling this summer to Italy and will visit with the Bursi and Sica families and Sophie will finally get a gondola ride in Venice.